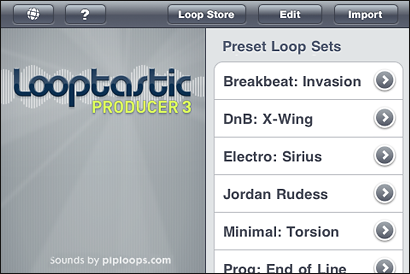 Looptastic Producer, the flagship of Sound Trends’ line of mobile music-production apps, is now more expressive, thanks to a flexible new mixer and effects. The three mixer zones now expand on the fly to fit the loops you add, facilitating custom cueing and submixes. Performers can now mute or maximize each loop with a single tap on its fader. And each zone can now be switched in or out of the effects loop with a tap, adding variety and motion to the mix. A new “scratch strip” above the faders shows the waveform of the last loop touched; tapping anywhere on the waveform retriggers the sound from that point. 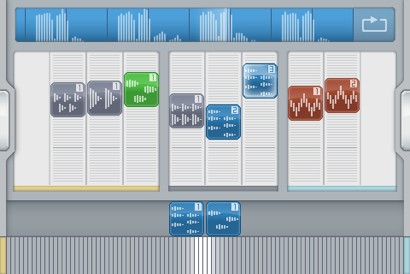 In looping mode, the sound then continues from the correct point in the recording: Scratch without screwing up! Turn off looping mode, and the sound plays only while your finger is down — excellent for deconstructing speech and triggering sound effects. Tap the side of the screen and the new tempo slider glides out; Looptastic changes the tempo without changing the pitch.